Frauscher is once more redefiningthe luxury day cruiser segment with the introduction of the 747 Mirage. The name “Mirage” refers to an optical phenomenon, as well as high-performance aircraft, giving the boat an aura of mystery. The 747 Mirage continues the approach Frauscher initiated with the previously launched 858 Fantom, both designed by studio KISKA, alongside hydrodynamic expert Harry Miesbauer. The features of the 747 Mirage are more radical however. Not only are they suggestive of supercar design, they also emphasize Frauscher’s racing heritage. attention was paid to elongate the waterlines as much as possible to reduce resistance and increase straight line speed. While the exterior shows an uncompromising focus on dynamics, the cockpit is a revelation of diversity. Several very practical innovations profoundly increase the usability to a previously unknown level for small, high performance day cruisers. Starting from the generous bathing platform at the stern, guests can reach the main cockpit area through the gangway without walking over the cushions. backrests. The co-driver’s backrest can be folded to create a sheltered chaise longue and by flipping down the main backrest the sunbed can be enlarged as well. The big cushion in the cabin can also be fastened on the front outside deck of the 747 Mirage to create an additional sunbathing area. Additionally, customers can select from a wide range of exterior and interior colors and the characteristic low nose design gives the driver a great front view regardless of speed. Available with three different Mercruiser petrol engines and a Volvo Penta D4 Diesel option, ranging from 220 HP up to 430 HP, the 747 Mirage‘s performance matches its looks, putting the possible top speed at 56 knots. With a generous 250 liter fuel tank, customers also have enough range for longer trips as well. As with all Frauscher boats, the 747 Mirage is produced at the Frauscher shipyard in Ohlsdorf, Austria, which was newly opened in 2012. 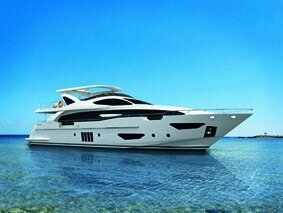 The boating world will experience the 747 Mirage at the official world premiere in Cannes, at the 2014 boat show. First customer deliveries are scheduled for early 2015.
in Salzburg, at the foot of Mount Untersberg in the heart of the Austrian Alps. 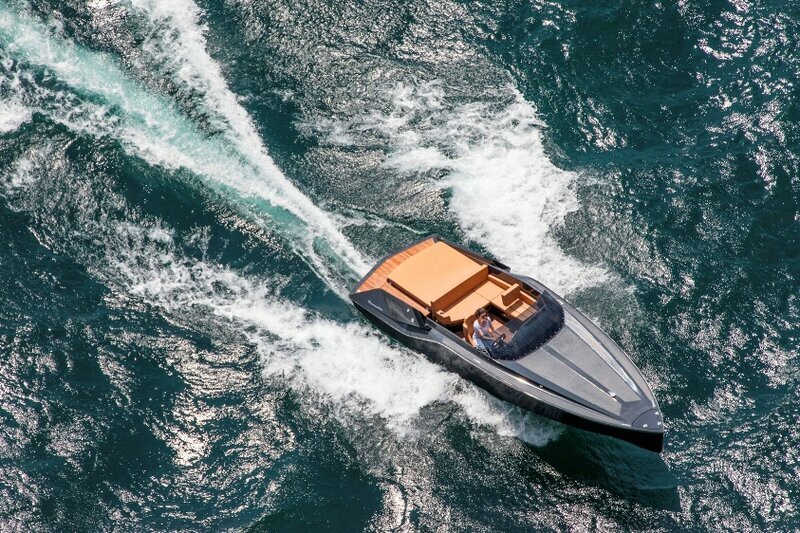 The studio /h/arry miesbauer yacht design (hmyd) was founded in spring/summer 2007 with its head office in Como / Italy and an office in Vienna / Austria. It is a yacht design studio in the “classical” sense, as it can provide the full package of yacht design, from the naval architecture and structural engineering, up to the exterior and interior styling. If requested they do, like for the Frauscher 747 project, just specific parts of the various yacht design areas.